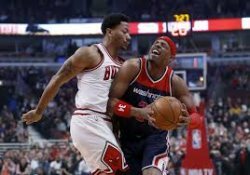 CHICAGO -- The Chicago Bulls lost their second straight home game on Wednesday night, falling to the Washington Wizards, 105 to 99, at the United Center. Bulls head coach Tom Thibodeau wanted his team to play harder and with more intensity following Monday’s loss to the Orlando Magic. The Bulls responded by coming out strong and taking the early lead with a tenacious defense that netted early steals and blocks. Derrick Rose finished with a season-high 32 points, including 17 in the opening quarter. The play of the game came at the end of the first quarter when Rose stepped back and nailed a half court heave to put the crowd in a frenzy. His efforts were not enough though as the Wizards used a balanced scoring attack to get back into the game in the second half. Paul Pierce led the way for Washington with 22 points while John Wall and Bradley Beal both helped with 21 and 17 points. Bulls center Joakim Noah did not start the second half due to an ankle injury. The reigning Defensive Player of the Year looked uncomfortable and did not attack or make good decisions like he normally does. His status is day to day. Chicago tried to make a run in the final quarter but clutch three pointers from Pierce and Wall finished off the Bulls efforts putting them up by 11. The Bulls look to end their 2 game skid when they take on Boston on Friday night. Photo: Paul Pierce (R) tries to muscle his way to the hoops against Derrick Rose in Wednesday night's action at the United Center. The Wizards beat the Bulls, 105-99.